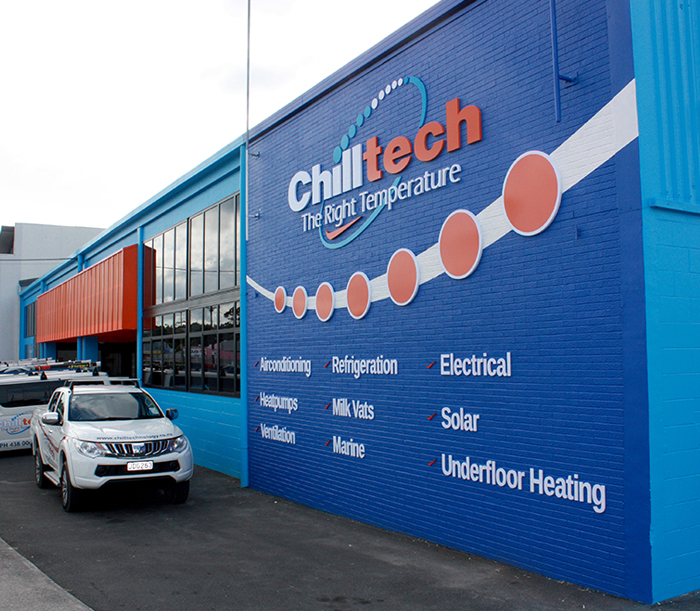 Chilltech officially opened its doors in February 1997, and since then we have grown into a thriving local business in Whangarei. For us, it’s easy, we provide our customers with friendly no-nonsense service, quality products and a professional attitude, and in return have happy, satisfied customers and a strong reputation in Northland. 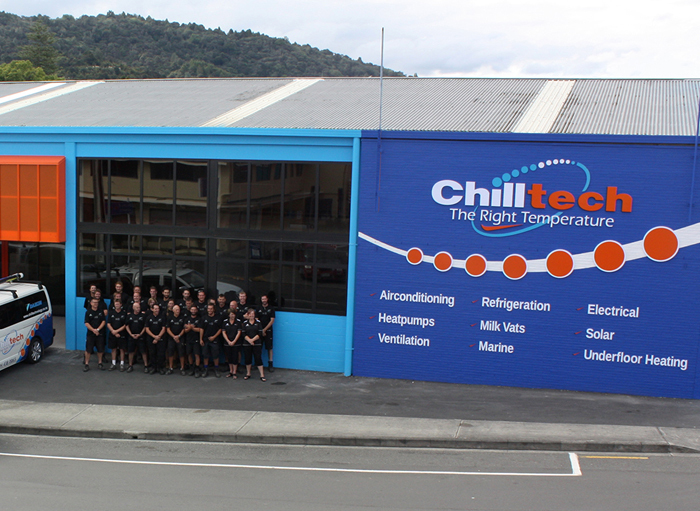 From humble beginnings and a staff of two, Chilltech now employs over 25 staff including refrigeration engineers, sheet metal specialists, electricians, heat pump specialists and apprentices and we continue to remain honest and down to earth in all aspects of our business. This reflects back on to the Whangarei community with Chilltech being active supporters of events like the Chilltech Beach 2 Basin, as well as supporting many local sporting and school organisations like Hockey Northland, Northland Golf, Northland Football Club and Kamo Intermediate School. We love giving back to the community. We pride ourselves on being local experts and market leaders when it comes to heating and cooling in both domestic and commercial environments. We are continually building our knowledge and skill base to provide our customers with the best solutions for their needs. More recently, we have expanded into Solar Energy installations and are very excited about the new addition to our business. It’s not just our excellent products that have helped make a name for ourselves over the years – it’s our attention to detail. We will never sell a product to a customer without knowing the full picture. We take care in completing an onsite visit including an extensive checklist of factors that we use to make sure that the best solution is found. With this knowledge, you can trust that we’re providing you with the best solution for your situation. We understand that a heating / cooling system is an important investment and we want you to make an informed decision. We aim to make this process as painless as possible, so we have a dedicated salesperson, and one of the largest heatpump showroom in Northland to exhibit our products and to remove the guesswork. We have also recently added solar panels to our showroom to give customers the opportunity to see first hand how they work and harness usable energy. Day to day we deal with all aspects of domestic heat pump and air conditioning needs, underfloor heating, milk vat refrigeration, marine and commercial refrigeration, ventilation and solar energy systems, so are equipped to offer expert advice, customised designs and qualified engineers for any work that comes our way. From a company that started from the ground up, now 20 years on, we stand strongly behind our brand and what we have achieved in Northland. We’re looking forward to the next 20 years and being able to continue to bring heating/ cooling expertise and local knowledge to the people of Northland. "The work was carefully executed, with competent and friendly staff"
"Right from the start we received warm and professional service and have been kept informed the whole way. The installers were great, they were polite and respective of our house and grounds." "Salesman and installation staff excellent"
"The service you carried out pre and post work has been fantastic"
"We are really happy with the result and can recommend Jim and your team for a professional job well done"
"The quick response to our enquiry by Jim Kettlewell was excellent"
"The service from your employees was superb"
"Appreciate the quality of service"
"The staff were courteous and polite at all times"
"We will certainly recommend Chilltech to our friends"
"We found the quoting process very informative. Tim and Dylan kept us full informed during installation and were particularly impressed with the detail taken to ensure cassette was centred and lined up with the front door. They cleaned up after themselves and were very efficient. We would recommend Chilltech to family and friends." "Thanks to Chilltech for the superior job in the delivery and installation of the Museum's new heat pump system. We would also like to direct our gratitude and appreciation to Tim and Brent for their exceptional workmanship. They were extremely courteous and respectful to the Museum and their staff. We would be happy to recommend Chilltech and their personnel to anyone who is considering installing a heatpump system." "Thoughtful consideration given to the most suitable system. All starff concerned with the installation were outstanding in every way you worked. You explained to our satisfaction how everything worked, followed up with an info pack, helpful advice and a demo and an assurance that we can phone if we have any questions." "The whole experience with Chilltech from beginning to the end was very good and a pleasant experience. Would highly recommend them!" "Staff were knowledgable with clean and tidy uniforms - they obviously knew their job! The finished result was great, very neatly done with no mess left. I can't find any faults - everything as promised." "Our first impressions of Chilltech were excellent, they provided efficient information and quoting. The staff were very knowledgeable and professional and the finished result is excellent. Would certainly recommend to others." "Great product. Friendly and tidy installers and would recommend Daikin and Chilltech to anyone." "Found Chilltech very informative and knew what they were talking about. This was basically what swayed our decision to use them. Very thorough in all aspects of the job and we just love our new heat pump! They guys did an amazing job, very clean and tidy, would definitely recommend!" "Great service from start to finish, your team speaks positively about your company. Not a straightforward install, but I thought your men did a great job. Give our thanks to Arron G as well. More than happy to recommend Chilltech to others." "Our quote from Arron came promptly and came with lots of comments and useful info. The installer was a very very good worker and very tidy and was great to have sparky compliance certification. Great follow-up by Arron with very useful info on operating procedures. All contact and procedures pleasant and very professional." "Prompt friendly, professional service. Arron was very helpful and the process was made simple deciding which unit to choose. Installers were efficient, neat and tidy. Explanation of operating our Daikin unit was easy to understand. Many thanks to all including friendly reception staff."